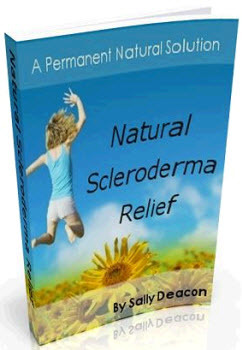 The very first point I want to make certain that Natural Scleroderma Relief definitely offers the greatest results. Obstructive lung disease occurs when something is getting in the way of the air flow. This is rare in children with rheumatic disease. Restrictive lung disease describes when the lungs themselves are not moving well. This can be due to weakness, but more often it means the lungs themselves are stiff. Most often, this happens when the lungs are involved by scleroderma, but it can happen with other rheumatic diseases. Creatine kinase (CK) is an enzyme produced by skeletal muscles, the heart muscle, and the brain. Although it may be elevated in adults who have recently suffered a heart attack, the most frequent cause of elevations in childhood is muscle inflammation. This may occur in children with dermatomyositis, scleroderma, or mixed connective tissue disease. Sometimes the CK is elevated with extensive exercise, but in these children the level goes back to normal after two weeks' rest. The level of CK is also elevated after some viral infections. Some children have elevated CK levels that persist despite rest and for which no explanation can be found see Chapter 14, on dermatomyositis. Or one of the newer biologics discussed below (although the biologics are classified separately, they are in fact immunosuppressive). The majority of children with arthritis do not require immunosuppressive drugs, but children with more severe arthritis will do much better if they are appropriately treated and their disease is brought under good control. Stronger immunosuppressive drugs are commonly used for children with illnesses such as systemic lupus erythematosus, dermatomy-ositis, scleroderma, polyarteritis nodosa, and Wegener's granulomatosis. The majority of patients with intraductal carcinoma or Stage I and II invasive cancer are candidates for a partial mastectomy. Absolute contraindications to the procedure are multicentric carcinoma, prior irradiation to the breast region, first or second trimester pregnancy, diffuse indeterminate microcalcifications on a mammogram, and the inability to achieve negative margins after an adequate number of surgical attempts. Relative contraindications are a large tumor-to-breast ratio and scleroderma or systemic lupus. Patients with invasive carcinoma who are clinically node negative should have their axillary nodal status determined by sentinel node biopsy or axillary dissection. Those who are clinically node positive require axillary dissection. Intestinal pseudo-obstruction encompasses several intestinal motor disorders characterized by episodes that suggest intestinal obstruction because defecation stops and abdominal distension, pain, and vomiting occur, but in which no mechanical obstruction is found. It may be due to primary abnormalities of the visceral muscle or nerves or be secondary to chronic renal failure, hypothyroidism, diabetes mellitus, amyloidosis, scleroderma, or muscular dystrophy. There is no effective treatment that is specific for intestinal pseudo-obstruction. If the patient has bacterial overgrowth, this should be treated with antibiotics. If nutrition is impaired, administration of liquid, low-residue feeds enterally is required rarely, parenteral (intravenous) feeding is necessary. Somehow all of these diseases that look so different in their typical forms are interrelated, but we clearly do not understand the connections. I have seen several children who simultaneously have skin lesions of morphea on their backs and abdomens, indentations typical of linear scleroderma en coup de sabre on their foreheads, ocular inflammation such as that seen in children with juvenile arthritis, and areas of linear scleroderma on their legs. Other overlap conditions may also occur. It is also important to recognize that children with Raynaud's phenomenon may have increased reactivity in other blood vessels. This is a rare complication, but I have cared for children with scleroderma who had chest pain and cardiac abnormalities because their coronary arteries constricted whenever their fingers blanched because of Raynaud's phenomenon. If the internal organs are being deprived of blood flow, the Raynaud's must be treated aggressively to prevent damage to these organs. It is important to recognize that discrete rheumatologic diseases share clinical features, and the individual patient may have evidence of more than one disease at a time. Thus, patients with SLE or scleroderma may have inflammatory myositis. Such overlap syndromes require diagnostic vigilance, but often result in therapeutic choices that are particular to the disease manifestation rather than the original diagnosis. Autoimmune disorders such as those discussed in this chapter are generally treated with immunosuppressive therapy. Corticosteroids are a mainstay of therapy in all of these disorders, but doses may vary widely, depending on the severity of disease manifestations. Among other immunosuppressives, those with more serious potential side effects are reserved for more severe disease manifestations. Often, however, the dermatologic manifestations of SLE and DM can be treated by hydroxychloroquine. This is a long-acting anti-inflammatory agent, not generally considered immunosuppressive, whose precise mechanism of action remains unclear. Hydroxychloroquine is frequently used alone or in combination with immunosuppressive therapy when skin rash is present however, it is not effective for the skin changes of scleroderma or the myositis of DM PM. Children and adolescents can present with signs and symptoms that are characteristic of more than one connective tissue or inflammatory disorder. This occurrence is more common in children and adolescents compared to adults. In our experience, children's signs and symptoms may evolve over time from those of one connective tissue disease to another. For example, combinations of features of JIA, systemic lupus erythematosus, juvenile dermatomyositis, scleroderma, and vasculitis are seen. 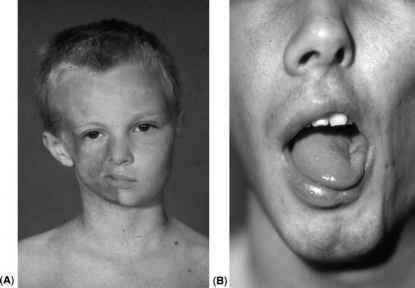 These children are best described as having overlap syndromes or undifferentiated connective tissue disease. Treatment should be tailored to organ involvement and underlying pathophysiology rather than be disease specific. Gastric stasis refers to the delayed emptying of gastric contents and this results in patients experiencing early satiety, bloating, nausea, and vomiting. Endo-scopy can confirm the presence of gastric stasis by finding retained food after an overnight fast. Systemic disorders such as scleroderma and diabetes mellitus can have neuromuscular effects that can affect the stomach. Neurological disorders can likewise cause gut dysmotility. When the laboratory reports the WBC count, it also reports the percentage of each different type of cell neutrophils, lymphocytes, monocytes, basophils, and eosinophils. Normally, the neutrophils make up the greatest percentage. In young children (under the age of five), lymphocytes are often increased. Eosinophils are often increased in people with allergies. They may also be increased in children with parasitic infections. Certain uncommon rheumatic diseases (such as eosi-nophilic vasculitis, some cases of scleroderma, and Churg-Strauss syndrome) are also associated with a significantly increased number of eosinophils. Significantly increased numbers of monocytes or basophils are very rare. Intravenous cyclophosphamide has been used for the treatment of children with systemic-onset JA who failed all other therapies. Although there are a few reports in the literature describing success, it is not generally utilized because the treatment is difficult for the child and family and it is not universally successful. With the current availability of many new therapies, the role of cyclophospha-mide in the treatment of children with arthritis is extremely limited. However, it remains a mainstay of therapy for children with vasculitic diseases, including SLE, dermatomyositis, and scleroderma. The future of cyclophosphamide in the therapy of rheumatic diseases may well lie in combining it with newer biologic agents, allowing a significant reduction in the total amount of cyclophospha-mide given. 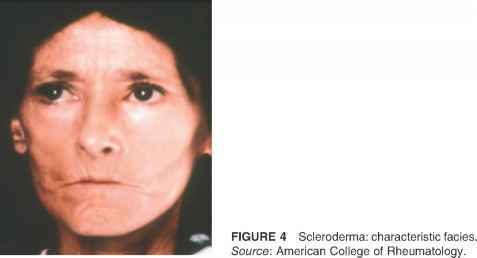 CREST syndrome is a variation of systemic scleroderma that has several peculiar aspects. The name CREST is an acronym that comes from the findings of calcinosis (pieces of calcium under the skin), Raynaud's phenomenon, esophageal problems, sclerodactyly (tight skin on the fingers), and telangiectasias (small red spots due to abnormal blood vessels in the skin). The key findings that distinguish CREST from PSS are the presence of telangiectasias and anticentromere antibodies.